Physician Assistant Studies students recently had a hands-on opportunity to learn about mechanical ventilators. What made the experience especially interesting? Their teachers were second-year respiratory care students. During two training sessions on Nov. 15, respiratory care students taught 45 PA students about four different models of mechanical ventilators. 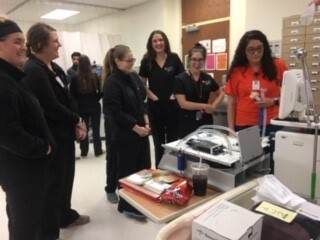 The PA students were eager to learn and seemed to enjoy being quizzed, said Kristina Ramirez, MPH, RRT, CHES, assistant professor and director of clinical education for the Division of Respiratory Care. The students learned how to turn the ventilators on and off, troubleshoot, read ventilator graphics, identify alarms and other key signs of possible ventilator-induced injury, as well as how to calculate ideal body weight to set appropriate tidal volume. The training will be especially relevant in the students’ clinical experiences and later in their careers, as physician assistants initiate orders for mechanical ventilation, Ramirez said. The participating PA students are currently taking a pulmonology course that aligns with learning the critical skill of initiating mechanical ventilators. Having the training before the students begin their clinical rounds is particularly useful, Bland said. “The students were fantastic,” Bland said of those teaching the sessions. The respiratory care students leading the sessions were Sana Hammad, Crystal Garza, Abdulaziz Alyami and Musallam Alnasser, Ramirez said. Bringing students from the two programs together was a great interprofessional exercise that will be repeated, she said, noting that the PA student feedback was very positive and showed that they gained an appreciation for the expertise of respiratory therapists.